Speedy midweek suppers don’t get much better than this. Shop-bought gnocchi cooks in only 2 or 3 minutes and this whole dish can be on the table in less than half an hour from start to finish. If you’re not familiar with gnocchi, it’s like a cross between pasta and mashed potatoes, so if you love spuds, you’ll love gnocchi too. If you’d like to jazz this up a bit, try adding some chopped sun-dried tomatoes, black olives, capers or chilli flakes or drizzling a little basil pesto on top. Cook the gnocchi in a large pot of boiling salted water for 2 or 3 minutes, just until the gnocchi floats up to the surface of the water. Don’t overcook or it will be too mushy. Drain well. Meanwhile, warm the olive oil in a saucepan set over a medium-low heat. Add the garlic and cook for 1 minute, just until it turns fragrant. Pour in the passata, then add the spinach and stir until it has all wilted down. Stir in the basil and season with salt and pepper, then stir in the cooked, drained gnocchi until it’s all coated with the sauce. Transfer the gnocchi into one large baking dish or individual gratin dishes and dot the top with spoonfuls of the ricotta cheese. Pop into the oven and cook for about 10 minutes, until the sauce is bubbling. Serve straight to the table. 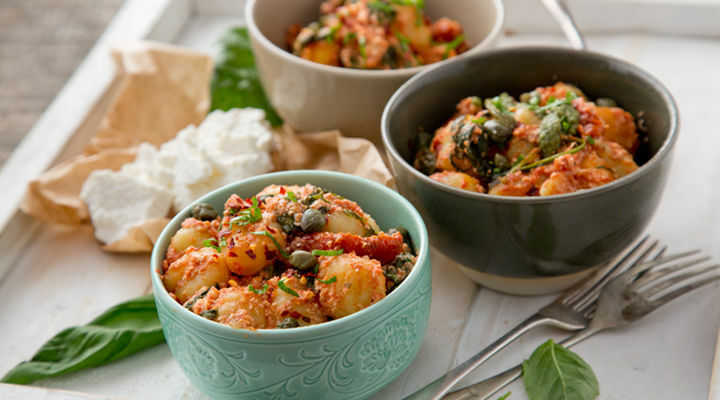 Tip: You could vary this by using your favourite pasta instead of gnocchi and stirring the ricotta cheese directly into the sauce along with the spinach to make it nice and creamy, in which case it would be ready to serve straightaway without needing to go into the oven.